﻿Johnson Saddle Shop is Northern Minnesota's only authorized Total Equine Dealer! Ask us about the many benefits we see when using Total Equine, especially for those horses with health challenges! TOTAL EQUINE® was developed from science and experience by Dr. Harry Anderson. The nutrient levels are based on what has been learned through scientific research over the last 40 years. The physical form of extrusion and the specific ingredients are what horses, mules and donkeys need to maximize health, attitude and performance. The base of Total Equine© is alfalfa hay, which gives it the smell and flavor equines love. The palatability is excellent. The fiber level supplies 70 – 80% of the equines needs for a safe ration. When fed with adequate, quality roughage, 4.00 lb. per 1,000 lb. 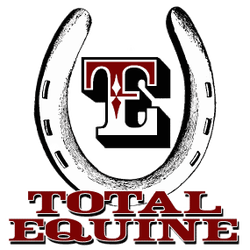 bodyweight of Total Equine© provides the nutrients required by mature equines.